In Windows 2008 R2 Hyper-V, The Virtual Machine failed to start as the VM has been moved to new place or modified the name where their symbolic link missing update. The below error might occur while trying to start the virtual machine. In this scenario, The VM Server2008 was trying to start and failed deliberately. The reason behind is VM was moved to new CSV and updated symbolic link. But the privilege was not properly updated. The application encountered an error while attempting to change the state of ‘Server2008’. 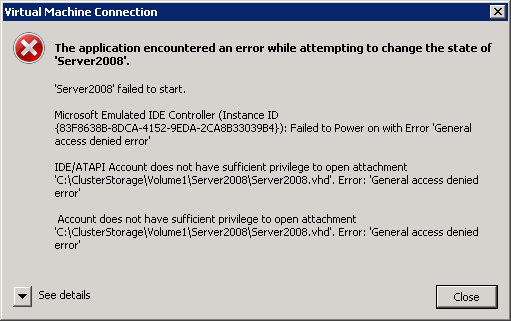 Event Id: 1069 Cluster resource ‘Virtual Machine Server2008’ in clustered service or application ‘Server2008’ failed. Event Id: 1205 The Cluster service failed to bring clustered service or application ‘Server2008’ completely online or offline. One or more resources may be in a failed state. This may impact the availability of the clustered service or application. Since VM was moved to new location, Inheritance security permission were applied. So need to provide privilege as mentioned below. Navigate to the folder where the VM hard drive .VHD and XML file are locate. Update with read-write privilege to Users and Creator Owner.